Keeping a clean home is a marathon, not a sprint. All of the little things that you do on a daily basis (tidying up, giving a counter a once over, etc.) add up to cleanliness. During the course of all of those little micro-chores, a lot of chemicals are used, flushed down the toilet and washed down the sink. Many of those chemicals are definitely not environmentally friendly. 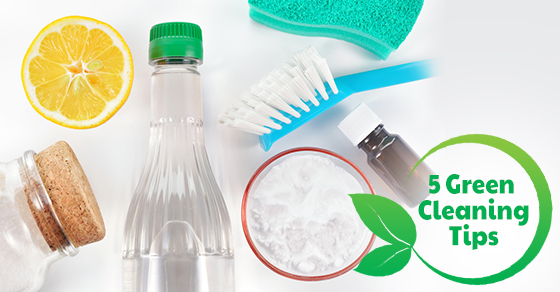 Here are 5 eco-friendly cleaning tips for a clean home. Invest in the 4 essential cleaning solutions. You can clean pretty much anything with vinegar, salt, baking soda and lemon juice. These all natural cleaning agents do not come with noxious chemical smells, they are tough on dirt and grime, and soft on the skin, eyes, nose and environment. Ammonia-based window cleaners are the enemy. Windows, and practically any glass surface in your home can be effectively cleaned with a few tablespoons of lemon juice diluted in half a gallon of water. Other useful and non-chemical-based products include witch hazel and rubbing alcohol. Designate an old t-shirt or rag as your go-to glass cleaner and avoid throwing out large amounts of paper towel or newspaper. The myriad of allegedly purpose-specific cleaners out there would have you believe that there is a single, effective chemical you need to be using on each different surface in your home. Vinyl recliners require vinyl recliner cleaner. Vinyl tiles require vinyl tile cleaner. Buying all of these chemicals is not only economically inefficient, but definitely not green. Pure lemon juice is an effective vinyl cleaner, regardless of the surface. Furniture cleaners and polishers are some of the worst offenders when it comes to damaging the environment. They are typically made from petroleum distillates and solvents, both of which are not only noxious, but hazardous. Olive oil and lemon juice can easily replace these nature killers. Your furniture will remain sleek and pleasant smelling and the environment will thank you. Metal polishers another terrible offender when it comes to toxic chemicals. Most of them contain ammonia and some type of stripping agent (like an acid). You don’t need any of those for perfectly shiny metal. Combine some salt and some vinegar and mix it into a paste with some flour, using equal parts of all three. Cover the entire surface of whatever you are cleaning, let it sit for an hour and then wipe clean. Cleaning your home is a must and we have all fallen victim to the sophisticated looking products that line our supermarket cleaning isles and promise specific and fantastic results. The truth of the matter is: you don’t need to spend the money, or go through the unhealthy and environmentally damaging process of applying all of these synthetics around your house on a daily, weekly, or monthly basis. Simple household ingredients like the ones mentioned will get the job done just as well. Easier on your pocket, your senses, and the earth.